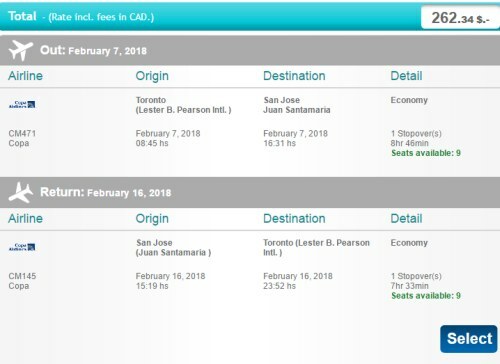 There are a few flights showing up on COPA from Toronto to San Jose, Costa Rica (SJO) in late February 2018 for $262 CAD roundtrip including taxes. The dates are really limited, so these may disappear quickly. 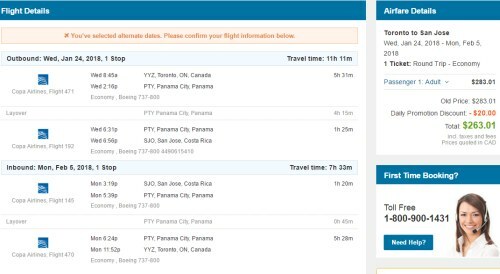 The flights have 1 stop in Panama City, Panama each way, for about 90 minutes. 3. 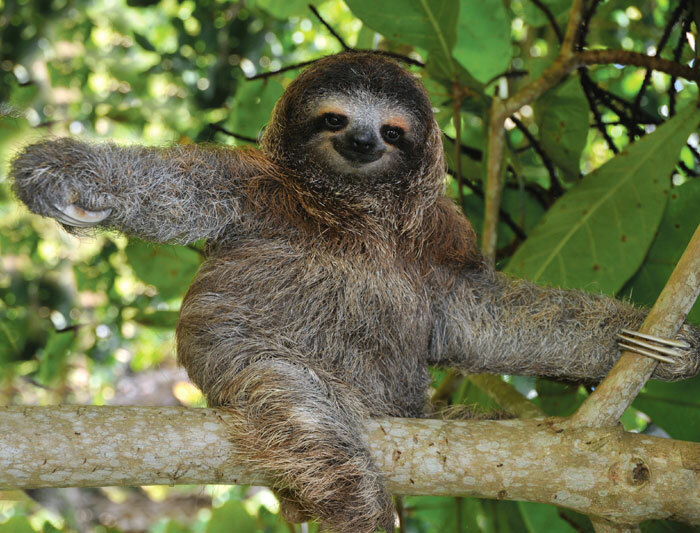 Click through from Momondo to Expedia or GoToGate. Update @ 12:55 AM EST - The March 5th return date seems to have just 1 seat left now. Focus on Feb 27 to March 6 or 8, which has more availability. Update @ 2:32 AM EST - Sold out! 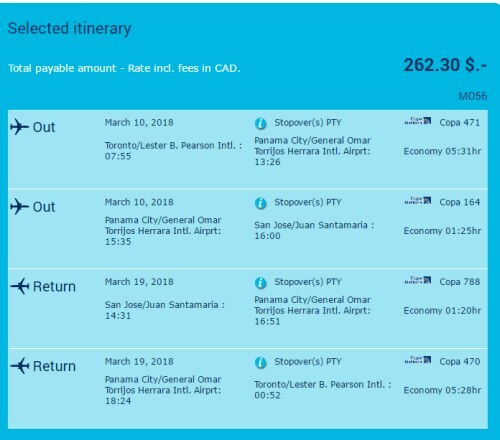 Update 5/5 - Some more of these flights from Toronto to San Jose, Costa Rica for $262 CAD roundtrip *may* be available in March 2018. Although it's only some lower quality booking sites that are showing them. Mar 7 to Mar 12, 13 - Try Momondo to Travel2Be or TravelGenio. 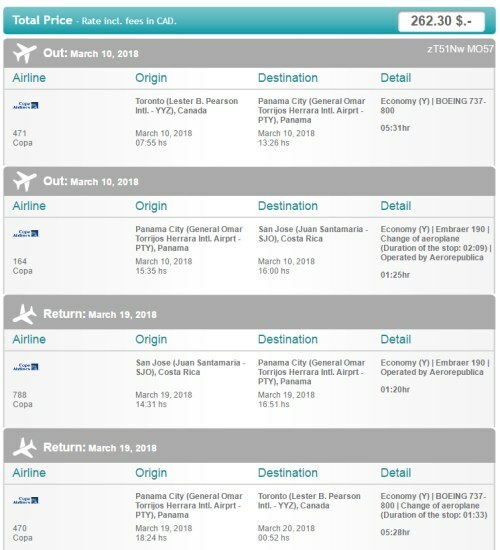 Mar 7 to Mar 19 - Try Skyscanner to Travel2Be. Mar 10 to Mar 19 - Try Momondo to Travel2Be or TravelGenio. Mar 10 to Mar 20 - Try Momondo to Travel2Be or TravelGenio. Mar 10 to Mar 22 - Try Momondo to Travel2Be or TravelGenio. Some of the September to early December 2017 dates are now verifying as well (they weren't yesterday). The dry season starts in November.